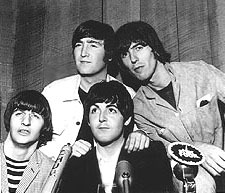 ABOUT THIS PRESS CONFERENCE: Fresh from the success of their famous Shea Stadium concert just two days earlier, on the morning of August 17th the Beatles flew from New York to Toronto for the second stop on their 1965 North American Tour. The Beatles performed two shows at Toronto's Maple Leaf Gardens. The following press conference took place between the two performances. From here the tour traveled southward for an appearance at Fulton County Stadium in Atlanta Georgia. Q: "Ringo, how did you propose to your wife." RINGO: "Same as anybody else, you know. Are you married? If you're not married, you'll find out." Q: "I want to be married but I want to do it right." RINGO: "You want to do it right?" Q: "How come you were not booked into Montreal for a show?" RINGO: "Ask our manager, you know. We don't know why. We just go where we're told." GEORGE "You can't go everywhere, you know. We've just got to take a pick." Q: "Ringo, would you still like to be a disc jockey?" RINGO: (long silence) "Umm. Oh! Yeah. Yeah." Q: "I'd like to ask Mr. Lennon why he took up writing and who is his biggest influence in the writing field." JOHN: "Uhh, I don't know why I took it up... and I haven't got a biggest. I suppose Lewis Carroll." Q: "George, which film did you like making most... 'Help' or 'A Hard Day's Night'?" GEORGE: "Umm, we enjoyed both of them, actually. I think the new one we enjoyed a little bit more, because we knew more about what the film business was about, you see... if that makes sense." JOHN: "What was it about?" Q: "John, is it true that you and Bob Dylan are the same person?" JOHN: "I didn't read that article, but I think it's quite funny. No, we're not." Q: "Are you expecting any further honors after the Queen and the MBE?" Q: "What are some of your immediate plans as far as filming, writing books, etcetera?" JOHN: "We make a new film sometime in spring, I think... in Spain. And that's all I know. I don't know what else we're doing." Q: "Do you like the shorter tour this year, as opposed to last year? Does it give you more time to rest?" Q: "What kind of shampoo do you use?" JOHN: "Anything we can borrow." Q: I'd like to know what happened to the color of John Lennon's hair?" JOHN: "Well, it's covered in sweat, you see, so it looks darker than it is. It's wet. (comic voice) That's why it looks different." PAUL: "He hasn't got his 'toup' on." Q: "Recently on the Musical Express Poll Winner's concert, and at Shea Stadium, you wore military type uniforms. Did you design them yourselves?" JOHN: "That's how it happened." PAUL: "That's the story of 'em made. This is one of 'em." Q: "Would you like to do a complete tour with all English acts?" RINGO: "We usually do in Britain. There's alot of them over there." Q: "Ringo-- over here, I mean." RINGO: "It wouldn't bother us, you know. Any of them could come on a show." Q: "Do you think that traveling with women companions hurts your image?" PAUL: "We're not traveling with women companions, you know. We haven't got an image." Q: "Of all the countries you've been in, which audience has been the most responsive?" PAUL: "Yeah, that's right. Gravel-rehhh. No, America because there's more people. It's the biggest place." RINGO: "Canada too, you know." PAUL: "I mean, and Canada. It's a wonderful place anyway, isn't it?" Q: "Paul, are you planning to marry Jane Asher?" PAUL: "Uhh, I haven't got any plans, you know. That's all. But everyone keeps saying I have. So maybe they know more than me." Q: "Would you ever like to visit Niagra Falls?" GEORGE: "We've seen the photographs of it." Q: "What was your reaction to your greeting in Rome?" JOHN: "We had a good greeting in Rome... contrary to rumors over here. There was nobody at the airport, 'cuz we arrived in Rome at five in the morning. But the show was a sell out. (deep voice) So, sit down!!" Q: "Did any of the boys have any difficult moments during the filming of 'Help!'" GEORGE: "Trying to get up, and to the studio in time." Q: "Are you bored with this life, or do you still find it exciting?" JOHN: "We still like it, or we wouldn't be touring." Q: "Are you going to have any more Beatles Christmas shows?" JOHN: "Ask Mr. Christmas Epstein." GEORGE: "Mr. Epstein may have a Mr. Epstein Christmas show." Q: "Question for John Lennon. Do you plan to continue writing, and if so do you have a medium mind?" JOHN: "Yes, 'cuz I think I'm under contract now... but I've got nothing in mind. It'll be the same stuff only backwards." RINGO: "Nothing in his mind... did you get that?" Q: "Individually, how do you like being the Beatles?" JOHN: "It's simply wonderful to be here." JOHN: "We like it... or we'd be the Rolling Stones." Q: "How much longer do you plan to continue on concert tours?" JOHN: "It's up to Brian, again." PAUL: "And it's up to the people who buy the tickets, too, you know." JOHN: "Till people stop coming to see us." Q: "Will Paul tell us a little about his marriage plans?" PAUL: "You just asked me, someone just asked me. The thing is, you see-- everyone keeps saying I'm married or I'm divorced or I've got fifty children." RINGO: "You've only got forty." PAUL: "I haven't said anything, but people keep making it up. So if you'd like to make it up... I'll sue ya." Q: "Have any of the boys had a mental block-out on stage?" JOHN: "You mean-- when you forget the tune, or something?" JOHN: "It happens, yes. Not very often, though." RINGO: "I think we've all had that." JOHN: (giggling) "I didn't know what key I was in last night!" Q: "Ringo, you mentioned to a photographer, who questioned you as to whether or not you were still taking pictures-- and you said, 'No.' because they're bored and what you take is pictures of hotel rooms. Do you feel that you boys stay in too much? Is it boring to stay in the hotel room, and that sort of thing?" RINGO: "It's not boring staying in a hotel room. It's boring taking photos in a hotel room." 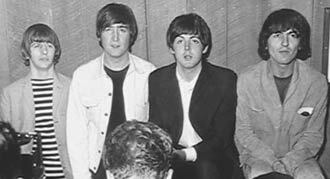 Q: "We realize that both John and Paul are both prolific songwriters, and we get the impression that the songs are written very quickly. How far in advance do you write the songs?" PAUL: "It depends, you know. If we feel like writing alot then we'll get ahead of what we've got to do." JOHN: (jokingly) "...ahead of what we've got to do." PAUL: "He's translating! Mainly we've just got to write to order, you know, if we're doing a new film or a new LP, or something. But it makes us work, you know." Q: "Do you not think it frustrating that you can't hear yourselves think while your singing?" JOHN: "How do you know we can't hear ourselves think? You weren't in our minds, were you. We can hear ourselves think or we'd forget what we were doing." PAUL: "But the thing about singing-- it doesn't matter, you know. 'Cuz the people pay to come in and do what they want. They don't pay to come in and do what other people want them to do. They're having a good time, you know. (exaggerated British accent) 'So leave them alone, and up with the workers!!'" PAUL: "They're having a great time." JOHN: "If they weren't they wouldn't come again and again. If they were having a bad time like you were having, they wouldn't come again." Q: "Do you think the new English groups are stealing alot of your limelight?" JOHN: (jokingly) "Yeah, it's terrible!!" Q: "Ringo, are you Jewish?" RINGO: (to the reporter) "Stand up-- that man-- or woman." JOHN: "He's having BarMitzvahs tomorrow." RINGO: "No, I'm not Jewish." Q: "If there had been National Service in England would the Beatles have existed?" RINGO: "'Cuz we would've been in the Army." PAUL: "We would've all been in the Army, you know. Unless we'd go in the same hut." Q: "Would Ringo consider changing his hairstyle?" RINGO: "For what? No, I'm quite happy, you know." Q: "What do you think of the news media keeping you in front of the public?" JOHN: "They're doing very well... and without them people wouldn't get to know what we're doing. So that's it." Q: "What do you think of the questions?" JOHN: "Some of them are good. Some of them are bad and some of them are good." Q: "What questions would you ask yourselves if you were in our position?" JOHN: "I couldn't think of anything, you know. That's why we simplify so much." M.C: "We've got the last question coming up here." Q: "Beatles, I was talking to Bill Haley of 'Bill Haley and the Comets' who got this whole show going as far as rock and roll. He was mentioning getting a Telstar show with the English groups and the American groups. Who do you think would win?" M.C: "A Telstar contest between American and English groups-- who do you think would win?" JOHN: "By the fans, at the moment, the English would win. But if other people watch it... if we judged it, the Americans would probably win." M.C: "I'm sorry, that has to be the end because of the timing for the next show."